For the past several years, Nancy Fountaine has been sharing her specialized form of healing with our guests. 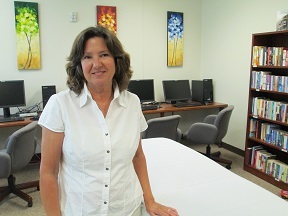 Energy Healing is a branch of alternative medicine where healers like Nancy uses light touch and sweeping motions with their hands to clear "physical and emotional debris"; energy that often manifests as pain, stress and inflammation. Sessions at Family House usually last up to an hour. All of our volunteers like Nancy are exceptional - always giving of themselves so selflessly. As staff, we recognize that we’re able to do our jobs well because of what they give to our guests every day of the year. And when you or a loved one is going through a serious illness, that moment of calm and restoration goes a long way. We thank Nancy and ALL our volunteers for the positive impact they have on our guests.